Pig skin disorders include parakeratosis; epidermitis; lice, maggot and mange infestation; and erysipelas. Any of these conditions may spread throughout the herd and result in the deaths of affected pigs. Monitor pigs for symptoms of skin conditions such as lesions, scabs, hair loss and excessive scratching. Prompt diagnosis and treatment of these conditions is critical to maintaining a healthy herd. Sarcoptic mange is caused by Sarcoptes scabei mites, which are rarely seen as they burrow into a pig's skin. Symptoms include rubbing and scratching, development of thick and scaly skin, and hair loss. All pigs in a herd, even those not affected, should be treated with ivermectin or doramectin to get rid of the mites. Zinc deficiency causes a skin condition in pigs called parakeratosis. Symptoms include slow growth in young pigs, raised, red patches on legs and stomach that then crust over and spread over the pigs body. These scabs can crack open and result in secondary skin infections. Pigs grown indoors are prone to the disease as pigs often obtain zinc from soil. Calcium and soybeans in the pig's diet inhibit zinc absorption. Monitor pigs' nutrition and mineral consumption, or monitor with liver zinc and serum testing, to prevent parakeratosis. Greasy pig disease, or exudative epidermitis, normally affects piglets under 8 weeks of age. The disease is caused by the bacteria Staphylococcus hyicus. Symptoms include listlessness, anorexia, greasy skin from excessive oil secretions, and skin lesions. Initial lesions appear as brown, greasy spots and later dry out and crust over. Piglets can die from the disease within three to five days. Prevent greasy pig disease by maintaining a clean and sanitary environment and washing pregnant sows. Infected piglets must be isolated immediately. Treatment options include injection antimicrobial medications and topical sprays such as Virkon, diluted tamed iodine or a 10 percent bleach solution. Pigs may be infested by the lice species Haematopinus suis. These lice only infect swine. They are easily visible, growing up to 6 millimeters in length. They tend to feed on the necks, ears, jowls, inner legs and flanks of pigs. Lice may carry other swine diseases such as swine pox, a virus that causes round or oval skin lesions. Symptoms include dermatitis, scratching, hair loss, restlessness and weight loss. Prevent lice infestation by keeping a well-managed and clean environment for the pigs. Treatment includes spray parasiticides that manage lice and injectable avermectins. Erysipelas disease is an infections caused by the bacteria Erysipelothrix rhusiopathiae. 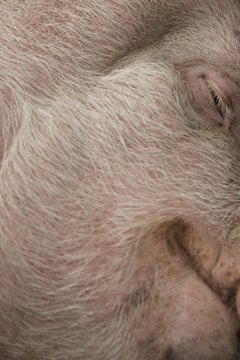 Some pigs do not show clinical signs of the disease. Others develop a chronic disease that causes endocarditis, lameness and enlarged joints. Acute cases of erysipelas are commonly called diamond skin disease due to the diamond-shaped skin lesions that appear. Acute cases also cause high fevers, painful joints and sudden death. Infected pigs are treated with erysipelas antiserum or penicillin; healthy pigs must be vaccinated to prevent the disease from spreading. Erysipelas disease can be prevented with vaccinations, quarantining sick pigs and good sanitation practices. Flystrike is a maggot infestation that occurs when flies lay eggs on the sores, wounds or dirty skin of a pig. When the maggots hatch from the eggs, they feed on the pig's wounds, worsening the condition. Prevent the condition by keeping your pigs and their environment clean, promptly treating sores and wounds, and using fly control measures such as sprays and fly traps.